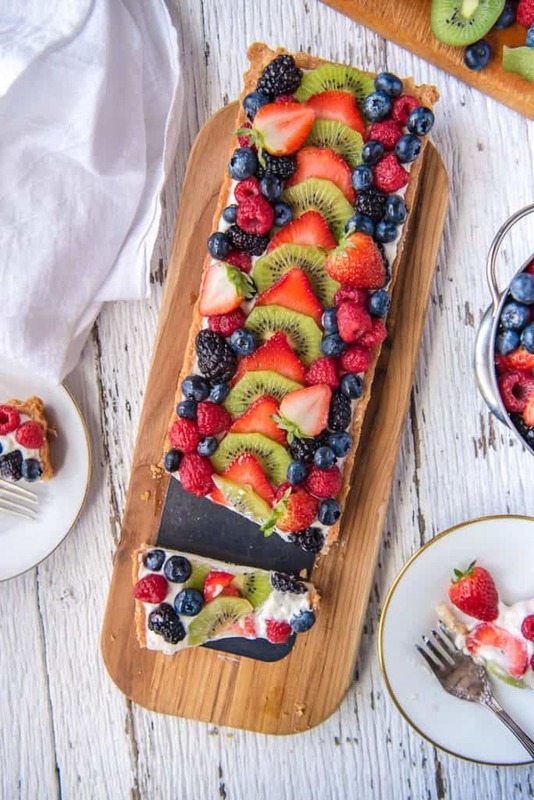 Spring comes alive in this beautifully impressive Whipped Yogurt Fruit Tart – a dessert as well-suited for brunch as it is for BBQs! Homemade lemon-lime curd and a whipped yogurt cheesecake filling sit in a shortcrust tart shell, then the whole thing is dressed up in the prettiest fruits of the season. Today, I’m sharing something that my Nana would have absolutely loved. She lived for her sweets – and she made it to 90 eating them on the daily, along with microwaved cups of coffee, Sunday pot roasts, and late night TV. Coincidentally, she would have been 104 today. I’ll be enjoying a slice of this lovely tart in her honor. JUST TAKE ME TO THE WHIPPED YOGURT FRUIT TART ALREADY! 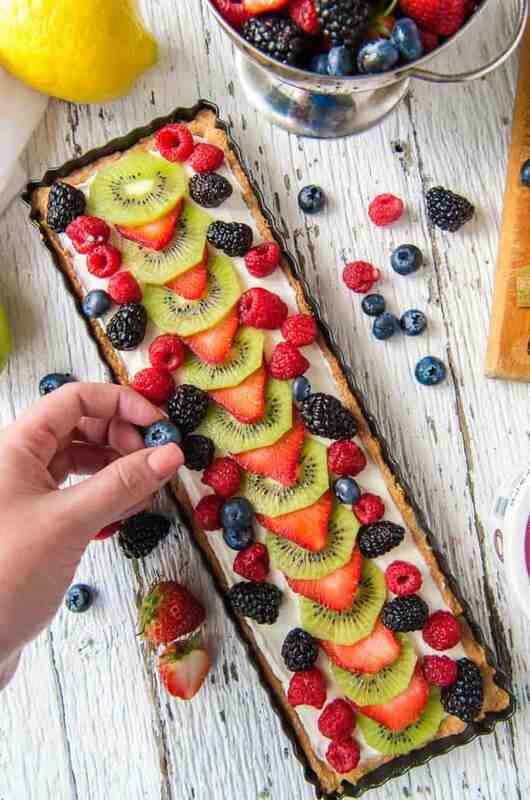 If you’d rather skip my (pretty darn helpful) tips and tricks, essential cooking info, and similar recipe ideas – and get straight to this deliciously easy fruit tart recipe, just scroll right on down to the bottom of the page where you can find the printable recipe card! My Whipped Yogurt Fruit Tart is a bit different than a French tart that you might find in a pastry shop. It includes a layer of fresh lemon-lime curd under a honey-sweetened whipped yogurt and cream cheese filling. I chose to use Nancy’s Organic Probiotic Greek Yogurt and Organic Cultured Cream Cheese in this recipe. Not only is it tasty, it’s loaded with probiotic cultures which help to balance your gut health and, in turn, your overall health. So even though you’re eating a dessert, there’s an awful lot of good in there. There are many ways to make fruit tart glaze, but my favorite one is deceptively easy to make and takes only two ingredients – water and apricot jam. The pectin from the jam encases the fruit and will keep it looking fresh for 1-2 days. To make the glaze, heat water and jam in a small saucepan until warm. Strain the glaze through a fine mesh sieve to remove any clumps of jam. , lightly brush the fruit with the watery glaze. If the glaze thickens or becomes sticky while you use it, rewarm it. Apricot is my flavor of choice due to its neutral-ish flavor and color. You could also use apple jelly with similar results. 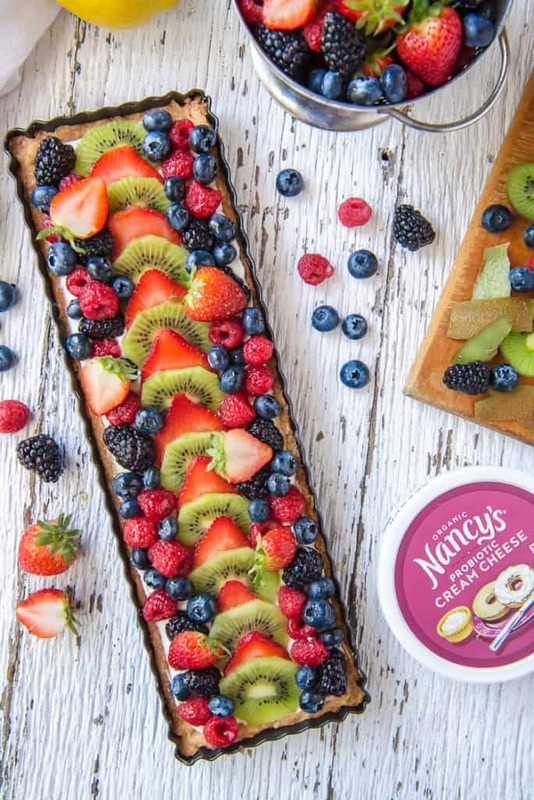 Can A Fresh Fruit Tart Be Frozen? Yes, but only before you top it with the fruit! This fruit tart recipe is not ideal for freezing, as cream cheese can weep when it’s thawed, but it can be done. Freeze the untopped tart, unwrapped, until firm. With the tart still in the pan, wrap it in two layer of plastic wrap, then a layer of foil. Freeze for 2-3 months. When you’re ready to serve, unwrap the tart, leaving a loose layer of plastic wrap on it. Allow it to thaw overnight in the refrigerator before decorating. What Fruit Is Best For A Fresh Fruit Tart? 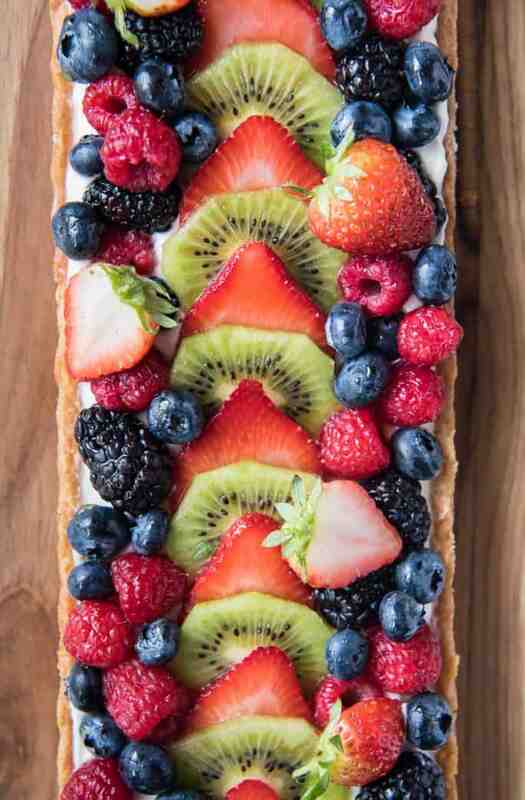 Honestly, your favorite fruits are best for a tart like this! 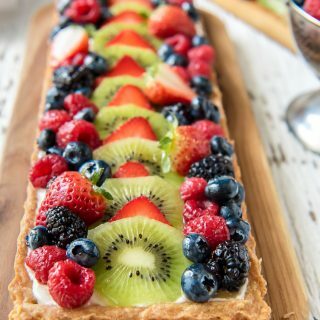 That’s the beautiful thing about fruit tarts – they’re essentially a blank canvas, and can be made with all of your favorite flavors! Regional and seasonal fruits are perfect for this recipe. A summer tart might look a bit different with cherries and peaches in place of the kiwi and berries, but it won’t be any less delish. If your event has a theme and you’d like your tart to match, that’s also something you can do! A tropically themed tart could include thinly sliced pineapple, mango roses, and passion fruit curd. A winter tart with various kinds of layered, candied citrus would be a stunner, as well. Even the lemon-lime curd is versatile. If you’d prefer a raspberry or orange curd in your tart, have at it! The shortcrust, lemon-lime curd, and yogurt filling for this fruit tart can be made the day before serving. Don’t assemble the tart until the day you plan to serve the tart, as they are best eaten within 24 hours. Make A Shortcrust Tart Shell. First, add flour, sugar, and salt to a food processor and pulse to combine. Add frozen cubes of butter, along with almond and lemon extracts if you’d like, to the flour mixture. Pulse repeatedly until dough starts to come together but remains crumbly. Next, press the dough into a rectangle tart tin, creating a thick rim and even bottom. Pierce the bottom of the tart shell with a fork, then chill in the freezer for at least 30 minutes. Preheat the oven to 375 degrees F. Bake the chilled tart shell for 20-25 minutes, or until the edges are golden brown. Remove it from the oven and allow to cool completely. While the crust is chilling, whisk together lemon and lime juice, zest, eggs, and sugar in a saucepan. Cook the mixture over low to medium-low heat, stirring constantly, for 10-12 minutes, or until it thickens. Be sure to do this part very slowly and methodically, or you may end up with scrambled egg whites in your curd! Next, remove the pan from the heat and add some butter, whisking constantly, until it’s melted. Transfer the curd to a bowl, press plastic wrap against the surface of the curd, and chill in refrigerator for 30 minutes. In a medium mixing bowl, combine yogurt, cream cheese, honey, heavy cream, and vanilla. Using a whip attachment, mix on low speed to start to blend. Increase speed to high and whip until mixture is thick and fluffy, 4-5 minutes. Finally, assemble the tart. Spread the cooled curd in an even layer over the shell. Spoon whipped yogurt over curd and spread it in a second even layer. 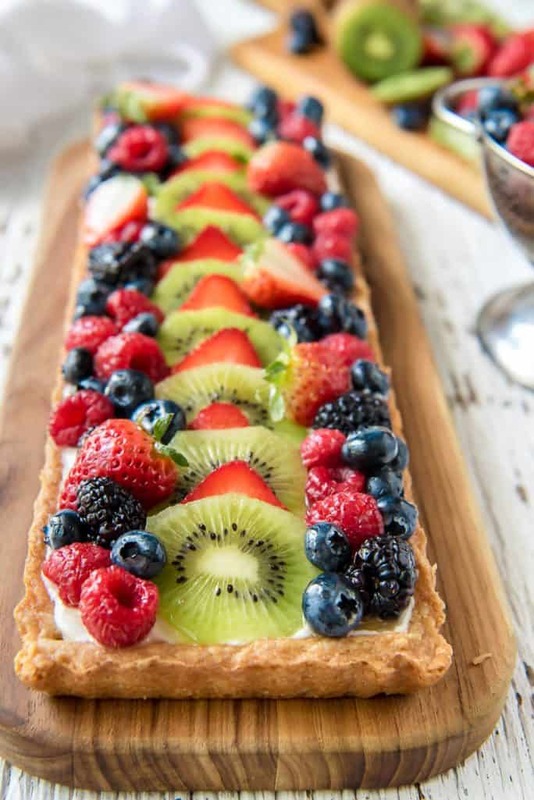 Top with your choice of fruit and berries, then brush it with a thin layer of fruit tart glaze. Chill your tart in the refrigerator for a few hours before serving. Store leftovers, covered, in the refrigerator for up to 3 days. LOOKING FOR MORE FRUITY DESSERT RECIPES? 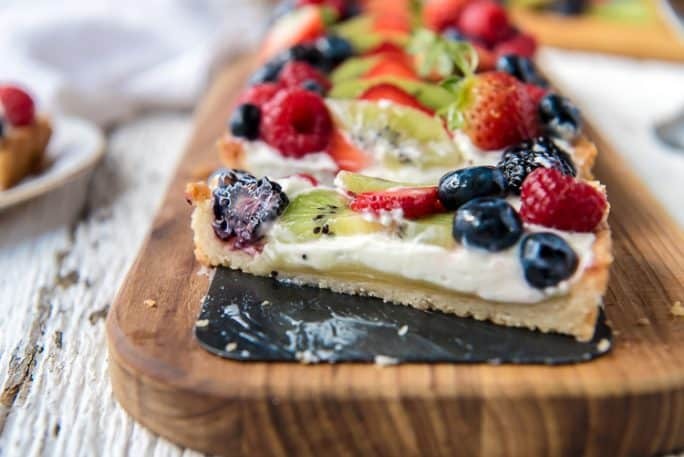 Spring comes alive in this beautifully impressive Whipped Yogurt Fruit Tart - a dessert as well-suited for brunch as it is for BBQs! Homemade lemon-lime curd and a whipped yogurt cheesecake filling sit in a shortcrust tart shell, then the whole thing is dressed up in the prettiest fruits of the season. Add flour, sugar, and salt to a food processor and pulse to combine. Add cold butter and extracts to the flour mixture, then pulse until dough starts to come together but remains crumbly. Transfer the dough directly onto a rectangle tart tin. Spread it to the edges, creating a thick rim and even bottom. Pierce the bottom of the tart shell with a fork, then chill in the freezer for at least 30 minutes. Preheat oven to 375 degrees F. Bake shell for 20-25 minutes, or until the edges are golden brown. Remove from oven and allow to cool completely. In a medium saucepan, whisk together lemon and lime juice, zest, eggs, and sugar. Cook the mixture over low to medium-low heat, stirring constantly, for 10-12 minutes, or until it thickens into a custard. Remove the pan from the heat. Add butter, whisking constantly, until melted. Transfer the curd to a bowl, press plastic wrap against the surface of the curd, and chill in refrigerator for 30 minutes. Combine yogurt, cream cheese, honey, heavy cream, and vanilla in a medium bowl. Using a whip attachment, mix on low speed to start to blend. Increase speed to high and whip until mixture is thick and fluffy, about 5 minutes. To assemble the tart, spread cooled curd over the shell. Spoon whipped yogurt over curd and spread in an even layer. 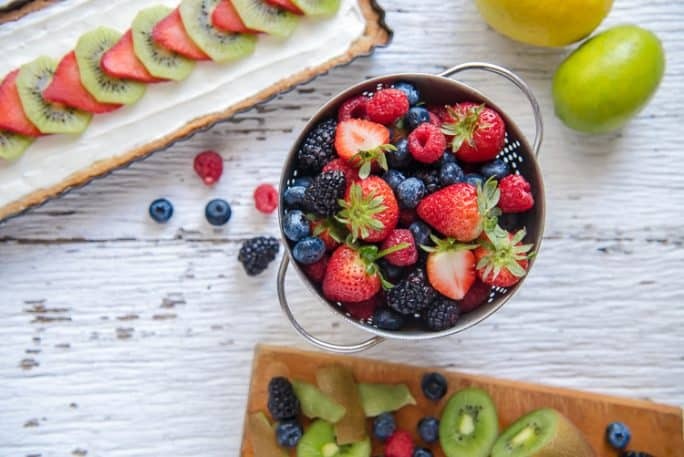 Top with your choice of fruit and berries. Place apricot jam and water in small bowl and microwave 1 minute. Whisk mixture together well, then glaze fruit using a pastry brush. Chill tart in refrigerator 2 hours or overnight before serving. 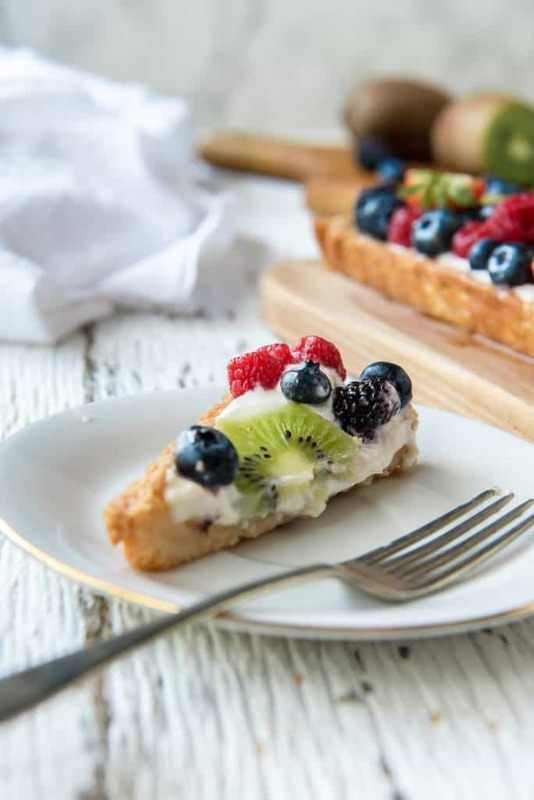 PIN THIS YOGURT FRUIT TART FOR LATER!